Czech-born, Osaka-based alpinist Michal Vojta is a relative newcomer to Japan’s volatile mountaineering scene, but he’s already making a name for himself through his awe-inspiring videos and appetizing blog. His latest creation is a video summarizing his feats from 2013, and provides an excellent introduction to the wonderful scenery of Japan’s backcountry for those who have not had the opportunity to visit yet. May this provide some inspiration to ‘step outside’ your usual comfort zone and explore a new peak. After a fitful sleep, I cooked the last of my supplies before packing up and hitting the trail. The fatigue from yesterday still hung over me like a swarm of hungry gnats. The rays of sunlight peeked from behind a bank of cumulus. If I hurried to the ridge I just might get some long sought-after vistas. Biei-fuji’s curvy cone rose majestically to my right, but I skipped the summit in favor of the craggy spires of neighboring Mt. Biei. I crawled up the crumbling slopes, losing one step with each two taken in a futile duel with gravity. Clouds began rising from the valley below, threatening to steal my cherished views. I pushed myself harder than ever, clambering up the last few meters until topping out on the shores of a gargantuan ocean of mist. Dropping my kit, I stood, mouth gaped wide, as nature put on her spellbinding performance. Mt. Tokachi pierced above the clouds like a lean-to placed gently among a softly sculpted field of snow. A deep gorge of hissing and steaming plumes of volcanic gas intermingled with the rapidly rising fog bank, two angelic figures engaged in a choreographed ballroom dance as I stood on the sidelines taking notes. Turning ninety degrees, the entire Daisetsuzan range that occupied my time for the last 5 days stretched out unabated, proof of my interminable drive to persevere through it all. Despite the rain, fog, wind and long distances, my trek had finally reached a point of unwavering bliss; even though I was stripped of panoramic views on both Mt. Asahi and Mt. Tomuraushi, the scenery spread out before me more than made up for it: I was bit by the hiking bug in a major way, the implications of which would alter the course of my tenure in life. Dreadfully, the clouds soon caught up with me, swallowing me in its entirety as I started on the long slither across the boundless scree fields of Tokachi. Although only 30 minutes as the crow flies, the journey took the rest of the morning, as poor visibility and even poorer footing reduced my pace to an infant’s crawl. By the time I had reached the summit I had lost all drive to continue. I needed nourishment and fast, but what edibles could possibly remain after such a long journey? I released the pack to investigate, pulling out my food bag to find a package of dried miso soup, a few grains of powdered milk, and a half-filled container of angel hair pasta. It was a meal fit for Bear Grylls, but I’d need some fire. As I reached in to pull out the stove, my hand came across a small hard lump wrapped in plastic. An elderly hiker had handed me a couple of pieces of candy on the climb up Tomuraushi, and here they were staring out at me. Hmm, miso-and-milk pasta, or apple candy? I put away my gear, sucking hard on the candy to try to squeeze every last morsel of energy from the sugar-packed coating. It wasn’t much but it gave me enough of a push to reach the junction for the hot spring. Mt. Furano, like Biei-fuji earlier in the day, would have to saved for another day. I worked my way through the accelerating winds and dense forest of cloud, reaching the top of a maze of stairs leading down through crumbling tufts of pumice. Hundreds upon hundreds of stairs stood between me and a hot bath, but the pressure of a relentless descent started to take hold, and my right knee let out screams of pain with each successive jolt. I had done the entire trek without a pair of trekking poles and I was starting to pay it. Once the path flattened out I was in a pirate’s limp, reaching the hot spring in time to refuel the body with both grub for the stomach and muddy sulfuric grub for the muscles. Next on the agenda was a ride back to civilization, but first I had something else on my mind. I stuck out my thumb, and the driver gawked at my destination: “Fukiage? But you just had a hot spring!” The driver dropped me off a few kilometers down the road to the bath entrance, a 10-minute jaunt down a narrow mountain path. Fukiage gained fame in the 80s TV drama Kita no Kunikara, and the twin outdoor baths set in a thick forest of natural vegetation are a sight to behold. I stripped, soaking my spent body in the therapeutic waters. Unfortunately my peaceful soak was cut short by a group of camera-wielding Chinese tourists, who came to rubberneck at Japan’s endemic culture of grown men marinating naked in the great outdoors. Once back out at the main road, I caught another ride a few more kilometers to a campsite, where I had planned to pitch my tent but got distracted by a brand-new hot spring accommodation called Hakuginso that had just opened. Not only was it affordable, but there was a kitchen that guests could use to cook meals, and the maze of outdoor baths in the garden made it a no-brainer. I settled into my room just in time to watch the rain fall in heavy sheets. Thus I had ended my trip in preciously the same way I had begun: in a sparkling new guesthouse in the company of Hokkaido’s ill-fated weather. At dawn, I crawled out of the tent to clear skies and a sea of cloud resting on the valley below. I thought about climbing back up to the summit to take in the views but I had another really long day awaiting, so after breaking down camp and stuffing a cereal bar down my throat, I bade farewell to Hiro and Maki and continued along the ridge. The route passed through a sea of bamboo grass, the maintenance decreasing in direct proportion to the distance from Minami Numa. I had finally reached the least traveled part of the traverse: most folks escape down to Tomuraushi hot spring before rejoining the mountain range further south at Tokachi. I fought my way through the overgrown mess, sweat darting from my tangled mound of hair like a malfunctioning sprinkler. Rays of sunlight pierced the openings in the foliage, transforming the landscape into a heat-shimmering sauna. Looks like summer had finally arrived on the roof of Hokkaido. After several hours of stamina-zapping movement, the path opened up to a series of broad hills, whose contours guided me to a deep col sitting on the doorstep of the 2000-meter summit of Mt. Oputateshike. The humidity and heat had attracted the clouds, blotting out the peaks like an ashtray full of spent ash. At the low point in the valley stood a flat area with room for no more than two or three tents. A group of university students occupied the largest of the sites, tent pitched among a latte of thick mud. An ideal place to spend the night this was not, so after chewing on some beef jerky, I loaded up the gear for the agonizing march up the final climb of the day, losing the path countless times in the dense fog and escalating winds. The crawl to the top easily took two hours: the last three days of full-on trekking were taking its toll. Once topped out, the pitch mitigated before dropping abruptly to yet another col at the front door of Biei-Fuji. A spur led to a small wooden hut situated on a flat shoulder of the volcanic cone. I dropped my gear and peeked inside the lodge. There was capacity for around 20 people, but I was shocked to find a group of nearly 40 occupying every square inch of the facility. There were even people who had laid their sleeping bags in the boot-covered entrance. I felt like telling them to bugger off and camp outside so I could have a warm place to sleep. After all, they were people who had just entered the mountain earlier that day, while I had been going nonstop for the better part of a week. In the end I asked about water sources and retreated to the lonely mist of the deserted campground. After setting up camp, I searched in vain for the only source of water: a small snowfield situated somewhere in the valley below. For the life of me I could not find it, and with darkness quickly setting in, I gave up, opting to filter and boil a puddle of rain water sitting next to my tent. I had reached a low point in my trek, but luckily there was only one more final push to the hissing steam vents of Mt. Tokachi, the final peak in the traverse. The torrent continued the entire night. Upon waking at daybreak, I lay in the tent in a rain-enduced trance. Not wanting to soak my kit or myself, I simply decided to wait out the storm, no matter how long it took. I rolled back over and drifted into unconsciousness again. We shared breakfast under the dissipating cloud cover while discussing our trekking itinerary. The were headed for Hisago-numa campground a half-day’s walk from here, while I wanted to push on to Minami Numa on the other side of Tomuraushi. We reached an agreement: Hiro and Maki would join me if I would be kind enough to keep a tent space for them. I left camp ahead of my companions, inching along the well-marked route through untouched swamplands before climbing the crest of a long slope. Here the terrain morphed into rolling hills sprinkled with boulders of every imaginable size. Depressions in the landscape framed ponds partially encased in ice, a reminder of the brevity of summer. Just past these frigid swimming holes a trail branched off towards the tranquil lagoon of Hisago, where a rustic mountain hut sat plopped on the far shore. It was straight out of a Snodonian daydream. From here the bedrock intensified, and it became a hopping game from rock to rock before the path vanished into thick cloud. The temperatures plummeted, forcing me to reach for an extra thermal layer in addition to my gloves. A few hikers worked their way silently from the hidden reaches of Tomuaushi above. I pushed on for several more hours before finally topping out myself. The views were obstructed but the climb was over. I dropped 10 minutes down the southern flank to Minami Numa campsite. I set up my gear on a quiet part of the sprawling campground, saving a bare patch of dirt for my new friends. Dinner was prepared and hastily devoured as the fog grew dimmer in the fading light. I relaxed in the tent, wondering if Hiro and Maki has given up back at Hisago. Just as I had resigned my fate to another night of camping alone, I saw two headlamps making their way through the maze of crags dotting the summit. My friends had finally arrived. After pitching their tent, they invited me in for rose hip tea and homemade cookies. These two knew how to travel in style. It was great to find a pair of kindred spirits with an immense love of nature and life. After dessert, the three of us split some fresh Hokkaido herb that had us flying higher than the clouds covering our camp. Leaving the gear at camp, I strolled leisurely to the summit of Kuro-dake to usher in the new day. A dense layer of cirrostratus prevented the sun from hitting the peaks, but at least the lower cloud bank had stayed in the valley for the time being. After breakfast I broke down camp, strapped on the pack, and headed through a vast valley of snow towards the summit of Mt. Hokkai. Despite it being early August, the snow pack resembled late spring conditions. Hokkaido doesn’t have an official rainy season to wash away the massive drifts, so in parts of Daisetsuzan the snow remains year round. A few people milled about the summit, including a group I had passed the previous day on the ascent of Mt. Asahi. Instead of the extended leg to Mt. Kuro, they’d taken the direct line from Asahi to this peak, where they’d loop back to the thermal comforts of a nearby hot spring. I continued along the ridge another hour to Hakuun hut, a rustic structure resembling a giant lunch pail. Since it was still early in the day, the decision was made to traverse a few more hours along the route to the next shelter at Chubetsu. The path extended through a broad marsh-dotted plateau, flanked on the east by a cascade of rolling bluffs that dropped to a sheltered valley framed by a series of rolling hills of tongue-twisty Ainu epithets. Beware-of-bear signs reminded me to keep my eyes and ears alert through the Takane marshlands, but the mammals kept a low profile in the mid-day heat. The weight of my pack, filled to the brim with a week’s worth of provisions and gear, helped keep my pace moderate. Eventually the A-frame configuration of Chuubetsu hut came into view, marking the end of another calorie-burning day of trekking. I pitched the tent along side two dozen other domes scattered throughout the front yard of the unmanned structure. It was 3pm when I finally pounded the final stake into the dirt. The beams of ultraviolet bounced off the neighboring snowfields, with a distant roll of thunder providing an atmospheric soundtrack. Snow was gathered for melting in the vestibule of my nylon abode while I double-checked the velcro attachment securing the rainy fly to tent frame. Just as the snowmelt came to a boil the heavens opened up, deluging our wilderness playground and sending the mountaineers scurrying for protection. I cooked dinner and drifted off, serenaded by the shower-curtain chorus of a northern country thunderstorm. Could the change in the weather force me into a zero day? Ah, Daisetsuzan National Park. The holy grail for Japan’s long trail community. Japan’s largest national park affords vistas like no other place. After an aborted trip last year, it was time to give the mountains their proper christening. As I stood on the edge of Sapporo city, thumb outstretched, I looked towards the plains of the east, hoping to catch a glimpse of their unhindered heights. An ash gray, 4-door Toyota sedan pulled up in front of my roadside perch. “Can you take me to Asahidake?” I inquired, using my best puppy-dog eyes. The driver, a father in his mid-40s, accompanied by his button smily 7-year old, willfully obliged. It turned out he was just out for a drive, but offered to take me all the way to the trailhead mostly out of kindness, but partly out of curiosity since they had never been to an active volcano. My initial plan was to camp, but the volcanic plateau was in a fierce battle with the elements when we arrived. Torrential rain fell from the skies as if to taunt me. “Are you sure you want to camp?”, ask my chauffeur. I definitely did not want to camp, and the sparkling youth hostel directly across the street from the campground made the decision for me. I booked a room while the driver bid me farewell, repeatedly refusing my offers to pay for gas. “We’ve just opened,” explained the manager of Shirakabaso, who gave me a quick tour of the grounds. This was hands-down the best hostel I’ve ever seen in Japan, at a true bargain at only 3000 yen a night. (it is now double the price) There was a Canadian log cabin annex out back, where a few other guests were browsing through magazines. During dinner, I got to know the other guests and we spend the rest of the evening solving riddles and telling stories, which helped me forget about the foul weather outside and my imminent engagement with the mountains the following day. The morning dawned overcast but dry, so I shouldered a week’s worth of gear and marched off to the start of the trail, which was marked by a stop-sign sized drawing of a cannibalistic brown bear with red Chinese characters warning visitors of their approaching doom. My stomach pushed tightly against my diaphragm as I bit my lip and swallowed awkwardly. What was I getting myself into? Since I wasn’t carrying a bell, I belted out some acapella in the loudest and most annoying tone I could think of. It was as if Eminem were teamed up with The Offspring, but much worse. Not only did I not see any of the caniforms, but my murderous bellowing most likely sent the other hikers scurrying to the hills as well. Actually, the first part of the hike was in absolute solitude, as 99% of hikers opt for the speed and luxury of the nearby gondola, which shaves 500 vertical meters off the climb. After skipping through some marshlands, I followed a narrow gully towards the ridge, topping out after about an hour of steady climbing. At the ridge, I met the trail coming in from the gondola on the left, where the crowds increased 10fold. Asahi-dake’s conical massif was hidden behind a thick layer of cloud. Further down the left side of the flank, a small caldera lake framed a canyon of steam vents which rose to meet the cloud layer. I skirted the outer edge of the lake before heading to the shoulder of the volcano on the right. It was tough going in the scree, but the path was easy to pick up thanks to the conservative placement of yellow paint marks every few meters or so. I reached the high point in high winds and zero visibility, taking off my pack in order to catch my breath and refuel. I headed down the eastern side of Asahi. The slippery scree gave way to even slipperier slush, as I did my best impression of a drunk ice skater. I somehow managed to stay on my feet through the maze of terror. I reached a small campground nestled on the edge of the snowfield, but I decided to make the most of the day by continuing on to Kurodake, which was home to a larger camp space with more amenities. Before me lay a vast igneous battlefield scarred with sulfur-stained gullies and hissing fields of steam. Imagine the Lake District sprinkled with a generous coating of volcanic seasoning. Since I had dropped back out of the cloud line, the route was easy to find. Signage warned of the dire consequences of veering too far off the trail, so I kept my wits about me, reaching the medium-sized hut at the base of Kuro’s summit plateau shortly before dusk. It was a long first day, but I knew that each successive day would require more milage if I wanted to make it to Tokachi by the end of the week. The overnight bus from Osaka to Nagano may be convenient, but the cost savings are offset by the lack of comfort and relaxation that the train provide. I arrived at 6:45am with heavy eyes and a heavier set of gear. Fumito was waiting patiently, having driven up from Shiojiri in the pre-dawn hours of a clear June morning. We turned the car southeast, past the quiet streets of Ueda and into the pasture-lined highlands of Sugadaira, the starting point of our goal of Mt. Azumaya, a gentle twin-peaked summit straddling the border of Nagano, Niigata, and Gunma Prefectures. As we reached the start of the hike, an elderly lady sat in a folding chair directly in the middle of the narrow dirt lane, explaining that we needed to fork over 400 yen for the privilege of parking our cars there. Yet another local trying to cash in on the popularity of the 100 peaks. We reluctantly handed over the modest fee, knowing that it would at least protect us from slashed tires if we tried to park illegally. The path skirted the edge of a expansive pasture home to the milk-squirting bovines that made Sugadaira so renowned throughout the archipelago. After leaving the grazing grounds, we ducked into the forest briefly before reaching the summit plateau dotted with igneous boulders. Snaking through this pumice maze towards Mt. Neko, the views behind us opened up to reveal an unobstructed stretch of the entire Hida mountain range. It was as if the Kita Alps were strung out on a gigantic clothesline to dry in the soft light of early summer. Though the views were enthralling, they were diminished somewhat by the aeolian haze hanging heavily over the Shinshu lowlands, making it appear like a smudged Bob Ross painting. Regardless, we could just make out Yari’s spearlike point still lathed in a cloak of wintry white. Fumito and I reached the summit of Neko a short time later, which offered our first vistas across a narrow depression to the taller pinnacle of Mt. Azumaya. We followed a thin snow-veiled spine before dropping through a meadow and back into a vast forest rising dramatically up the other side. As the grade increased, we grabbed tree branches, roots, foliage, and anything else we could find to assist in our anti-gravitational swim through the rotting snow. Thirty minutes into our sweaty effort we reached the summit ridge, turning left for another quarter of an hour until topping out on Azumaya. Mt. Asama rose dramatically across a valley of low-lying cloud, still spitting volcanic gas and ash from the 2004 eruption. A modest weather-beaten shrine sat directly on the constricted rock outcroppings of the high point, so after a brief lunch, we prayed to the mountain kami for safe passage back to the trailhead. Descending back to the junction, we continued straight on towards the less prominent peaks of Naka-Azumaya and Ko-Azumaya through an area of rustling rhododendron and savory mountain sakura still in bloom despite the early-June humidity. The trail led us into a dense forest of oak, beech, and birch sprouting their fresh vibrant folioles. The woods once again gave way to pasture-land which we followed back to our awaiting car. Before setting off, Fumito and I partook of soft serve ice cream made from the fresh milk of the cattle next door. Azumaya was peak #49 on the list, and we joked about being able to knock out another peak before our day was done. Flipping through my guidebook, I realized that Kusatsu-shirane, a peak that we had to turn back from in the winter, was just a short drive away. When I broke the news to Fumito, his face lit up like a child opening a birthday present. “Let’s go now,” he shouted, as we raced back to the car in a passionate pursuit of revenge. The mountains facing the Sea of Japan rarely get a break. The Siberian winds whip up moisture on their journey from Russia, depositing immense loads of powder snow that lingers until the arrival of the summer rain front, which keeps the Hokuriku region locked tight in a slippery vice grip. When it’s not raining or snowing, the peaks seek shelter behind veils of low-lying cumulus, withholding the vistas to all but only the most dedicated few. 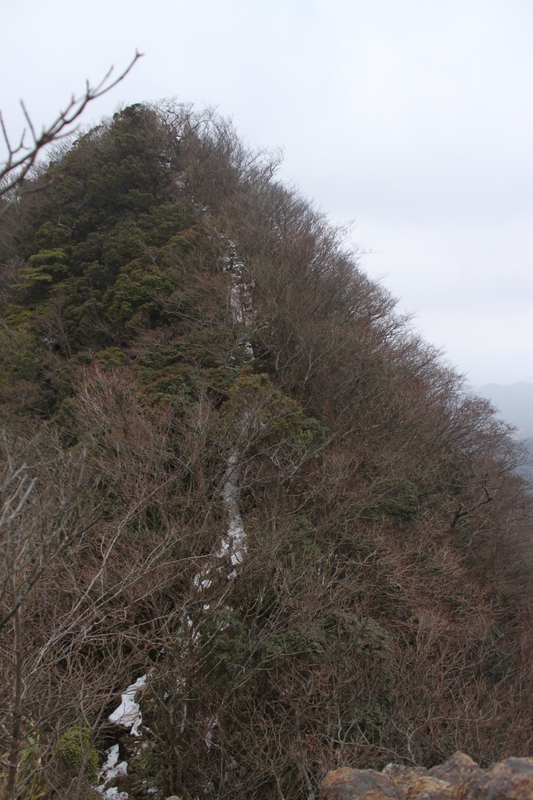 I had studied the meteorological charts for weeks, looking for a rare clear-weather window to explore Tsuruga’s most hallowed peak: the beech-crowned heights of Mt. Nosaka, ‘the wild hill’. My chance came on a Tuesday. Not the best of timing, but when that window opens, you have no other choice but to tempt fate and jump out. I boarded the Limited-Express Thunderbird train at the luxurious hour of 9am for the 90-minute sprint to Tsuruga, where the Obama line regurgitated me on the steps of Awano station. The cloudless sky burned a glorious shade of blue as I marched up the paved road to the A-frame bungalows marking the entrance to the forested path. Puddles of black ice waited to catch the unwary driver or, in my case, the lone hiker off-guard. Several times I slipped on the horizontal verglas, saving myself from a likely bruise with some quick handwork with the trekking poles. I soon hit snow, but held off on the crampons until there was unobstructed ground cover, and slowly marched along the easy-to-follow path. Judging by the well-worn prints, several climbing parties were already on their way to the top. 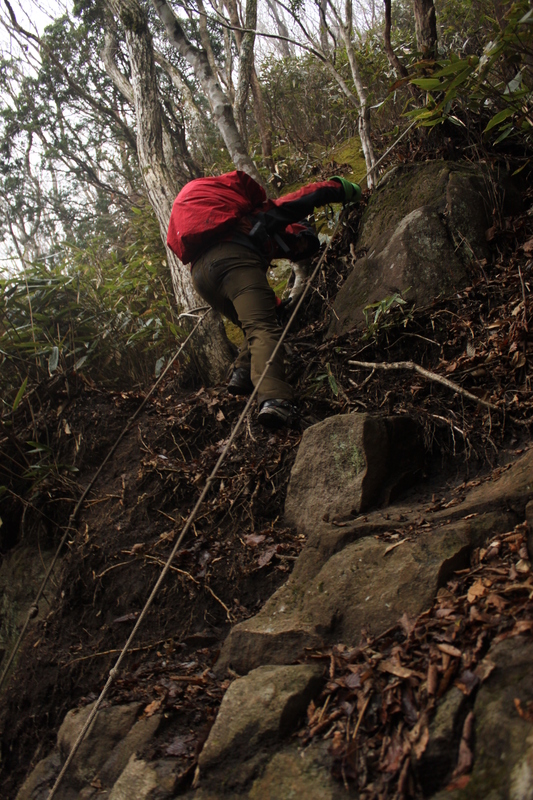 The route crossed a stream several times before scaling a small metal staircase which marked the true start of the climb. Here I latched the 6-pointers firmly to my soles and continued my vertical progress towards the ridge. Through gaps in the bare tree limbs I could begin to see the contours of Tsuruga city expand directly below: it resembles most port towns in Japan except for the unusual concentration of nuclear power plants hidden in the coves to the west. After an hour of brisk ascending I topped out near the ridge and got my first unobstructed views of Hakusan’s curvy mastiff. It appeared as if the baker had gone overboard on the frosting for this gargantuan birthday cake to the deities. The peak was well on the way to an average snow year, and if the current rate of precipitation continues, it could very well set a new record for snow depth. Early January, however, is much too early to make such predictions. Besides, I had a mountain ahead of me to climb. At my first rest point, I met a lone hiker on his way down from the summit. “This is the best January weather in over 5 years,” remarked the tan-skinned elderly gent sporting a thick white beard. Despite the icy conditions, he was wearing only a pair of rubber rain boots and opted for the thickness of the untouched powder rather than the slick grooves of the main trail. He told me it would take about half an hour to reach the summit from here, even though the maps suggested a conservative time of 50 minutes. From here I reached the ridge, clambering over a series of false summits through a tunnel of elderly beech trees accustom to the stinging gales of winter. I soon spied the roof of the summit emergency hut protruding from the top of the next rise, and sure enough, about thirty minutes since leaving my haunches, I topped out to some of the best panoramic views I’ve seen in Kansai. The mountains of Gifu pierced the sky sharply, while a long strand of cloud hid the Kita Alps from view. Mt. Ibuki and the rest of the Lake Biwa Orchestra belted out a silent tune, while further to the west the peaks of northern Kyoto Prefecture begged for attention. That was still one area I had yet to explore, as access made a day-approach without an automobile all but impossible. I chatted with another group seeking shelter from the winds in the emergency hut. They were all from Tsuruga, and were quite surprised that I had come all the way from Osaka just to climb their local mountain. I explained that Nosaka was indeed one of the Kansai Hyakumeizan. They laughed that it was included on the list: “this is Hokuriku, not Kansai.” They had a point. Deciding to play it safe, I headed down preciously the same way I had climbed, forgoing any shortcuts off the mountain. I’ve taken enough risks on snow-capped peaks trying to shave a few minutes off a hike. The way down was actually more challenging than the climb, as the crampons threatened to send my ankles into contorted positions that the tendons were not designed to accommodate. Once I reached the river again, I took off the irons for the walk back to the pavement. One of the hikers I had met in the hut offered me a ride to Tsuruga station, where I was just able to make the train back to Osaka. I had now completed 71 of the Kansai 100, which left me with a new challenge: reach magic number 75 before the start of the rainy season. Time to start more intensive planning. Enzan looks like most places in Kanto: layers of reinforced concrete buildings clustered around the central train station. There is one noticeable difference, however. The medium-sized city in Yamanashi is home to one of Japan’s cheapest modes of transport. For just 100 yen, the community bus will shuttle you half an hour to the trailhead of Daibosatsu, my target for this tepid May morning. Despite the affordable price, the bus was only about a third full – it seems the majority of mountaineers in Yamanashi Prefecture prefer the flexibility and convenience of their own four wheels of luxury. The trailhead was flanked on both sides by a couple of mountain huts that have seen better days. I followed the grooves of the well-worn concrete road that eventually led to a dirt path through forests of beech and chestnut just beginning to awaken from a long, frosty winter. A soothing breeze blew in from the valley as the sky flexed its ash-tinged hues. I strolled along, lost in my thoughts while thinking ahead to the productive summer awaiting. Here I was on mountain #48, on task to reach the halfway point before the June rains settled in. Birdsong accompanied my tranquil reverie, offering a soundtrack that accompanied me all the way to the large village sprawled out at Kamihikawa Pass. Dozen of hikers milled about, stretching their legs or shuffling through their immaculate gear in preparation for the easy stroll to the high point. The development reminded me of the busier sections of Yatsugatake. With the overpopulation of the Kanto region, the mountains are put under an environmental strain unmatched in more rural areas of Japan. Basically the farther away from Tokyo you get, the lesser the impact. The next half an hour followed a road lined by even more cars and mountain huts. It seemed that half of Tokyo had come to frolic in the golden fields of the summit plateau, but why the immense popularity? I pushed on under the watchful eye of Mt. Fuji, whose snow-stained summit peeked out above a foamy latte of bulging cloud. When I reached Daibosatsu-toge, the answer to my riddle was finally solved: it turns out that the trail is part of the Oume-kaido, the main route between Edo and Kofu, the capital of Kai Province. The samurai pledging allegiance to the Tokugawa shogunate haunted these hills, and if the writings of Nakazato rang true, slaughtered an unarmed Buddhist monk upon these very slopes. Whether fact or fiction, the box office depictions of Ryunosuke Tsukue’s cold-blooded act put Daibosatsu on the map for jidai-geki fans. From the pass, the route spilled out into a vast open plateau, crowned by a pocketed forest of oak and cedar. Japan’s highest peak had by now sunk into the billowing elixir, but an array of other peaks shimmered in the afternoon haze. Groups sat scattered among the hill like spectators waiting for an outdoor concert to start. I kept on the move, climbing up to the edge of the meadow before ducking back into the woods to the high point of the mountain, where I dropped off the northern flank into a shaded swarm of virgin hemlock trees, one of Yamanashi’s 100 most beautiful forests if you can believe the literature. The deserted path was refreshing considering the immense crowds on the southern side of the mountain. I soon reached Marukawa hut, a rustic green-roofed structure sitting in an open meadow bathed in warm sunlight. If I had more time I would have definitely stayed here, enchanted as I was by the peacefulness of the wonderful setting. I sat on a bench, snacking on my late lunch while soaking up both the ultraviolet rays and the rural scenery. Reluctantly, I rose to my feet and completed the rest of the loop, reaching the trailhead with enough spare time to enjoy a bath at the hot spring a few minutes walk down the road. After my soak, the bus pulled up, completely packed with day hikers who had boarded at the trailhead above. I was barely able to squeeze into the doorway of the jam-packed bus. Perhaps those crowds I had seen earlier had not come by automobile after all. Still scratching my head, one glace at the guidebook revealed a partial explanation: this hike was designed as a two-day trek, with a layover at one of the many huts along the way. No wonder I was feeling so drained. I’ve been eyeing Mt. Kogo’s pointy crags for a number of years, both on paper and in person, so what better way than to usher in the year of the horse than to knock off my final peak in the Soni area of Nara? I hoped to fare better off than my first hike of last year. Paul and I arrived at Nabari station shortly before 10 on a cloudy Saturday morning. A few people milled about the station, returning from their early shrine visits and seeking the balmy comforts of their kotatsu tables still lined with half-full bottles of New Year’s sake. The bus to Soni was completely deserted, so we spread our gear and bodies on the entire back row as our driver negotiated the switchbacks up and over Shorenji dam, along the still waters of river of the same name, and onto the sleepy backroads of Soni village itself. Once off the bus, we switched on the GPS to get our bearings and followed the forest road for close to an hour to O-toge. We spent the majority of the one-hour stroll racking our brains for the name of the 2-wheeled self-balancing machine invented by entrepreneur Dean Kamen. Was it a Zenith? A Vespa? Frustrating it can be when the answer lies stubbornly on the tip of your tongue. Since neither of us own a smart phone, I finally broke the stalemate by calling a friend: the Segway! At the mountain pass, the trail to the summit ridge towered directly above us, with no way to go but up. Whoever made the trail decidedly took the lazy approach – a series of long ropes draped down from trees on the ridge itself. We could do nothing other than hoist ourselves up through the fields of plume grass clinging wearily against the 70-degree slopes of dusty sandstone cliffs. The views opened up behind, revealing the snowy spires of the Daiko mountains sitting under a veil of dark, ferocious cloud. A weather front was on the march, looking to trample us in its path if we didn’t get a move on. Unfortunately, traversing along the cliffs was anything but a brisk stroll. Any gains in altitude were lost just as quickly as we traversed over several humps of tree-covered rock. 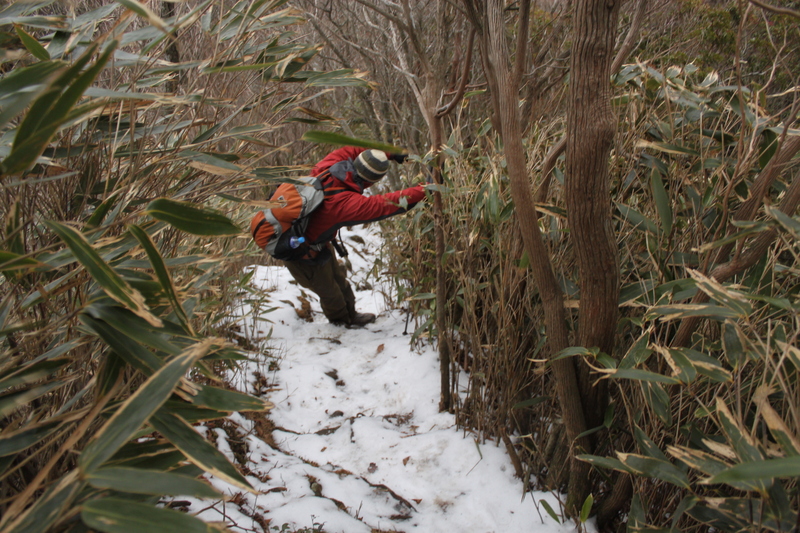 We hit snow on the summit of Minami-dake, the tallest point along the entire route. Our panoramic views were soon pillaged by cloud vapor, blowing horizontal snow and sleet across the ridge like a old man stoking a dying fire. We dropped off the ridge, carefully picking our way among the maze of ice and rock, using tree trunks on either side to slow the inevitable slide. We had discussed putting the crampons to use before the tempest hastened our decision to keep moving. At the top of the next rise I rummaged through my gear, handing Paul one of my 4-pointers. At least we’d both have one solid purchase for the roller coaster ride. Two peaks later and we topped out on summit #5, otherwise known as Mt. Kogo. The trees provided a bit of shelter from the swirling squall as Paul pulled out his sparkling new Montbell 6-point snow spikes. After fiddling around with them for close to 15 minutes, we both gave up hope of getting them securely to his feet. It wasn’t that we didn’t know how to affix them, but that the straps were frozen and hard to maneuver in the frigid temperatures. Besides, the strap system is way too complicated than it needs to be. I can slip my crusty old Kajitax 6-pointers on in less than 30 seconds, but pehaps that’s because I know the loop system from memory. By now Paul’s hands had gone numb, so I lent him my alpine winter mitts disguised as a pair of boxing gloves. The circulation came back within minutes as we descended out of the snow line and down to a soggy mountain pass. Here we cooked lunch and warm coffee, thanking our lucky stars for safely navigating that knee-knocking traverse. We skipped the ascent of an adjacent peak in favor of the hot spring baths that were literally calling our names from the valley. Between gusts of wind you could just make out the proprietor saying “Wes-san, Paul-san, oide yo.” Or at least I think that’s what I imagined her saying. After a brief detour through the golden grasslands of Soni Kogen, we hit the forest road just in time for Paul to turn his ankle on a pine cone. Fortunately the damage was minor but we still had to slow our pace somewhat to limit the pain. The bath, though filled with lazy day-trippers out for the first bath of the new year, was incredibly soothing. I don’t know why bathing establishments even both with an indoor bath. Every time I head to a hot spring I make a bee line outside to commune with nature. Once the abolutions ceased, I lent Paul my ankle brace while we strolled through the darkening forest to the bus stop. Again we were the only two passengers for the one hour journey back to Nabari, and to add insult to injury, the return train was packed with worshipers making their way from Ise Shrine. I know passengers are supposed to give up their seats to elderly and pregnant people, but shouldn’t this custom also apply to achy-boned mountaineers?